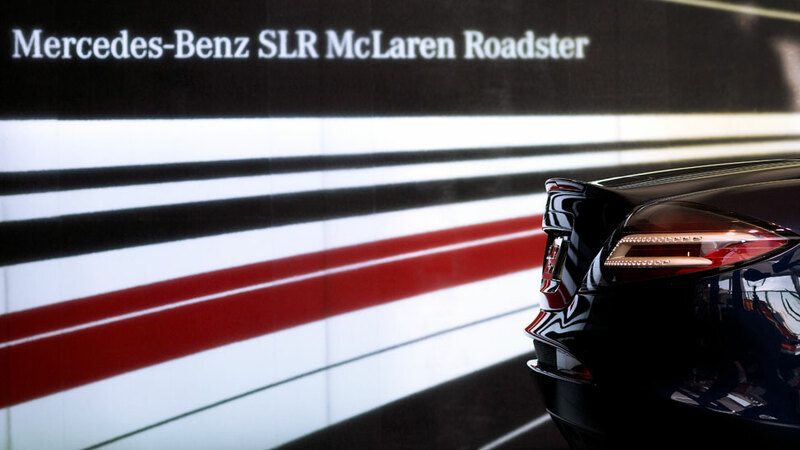 The stand is divided into the intimate consultation zone and the floodlit presentation area for the SLR Roadster. The wall of light is made of Kapipane, which is usually used in office facades. The open capillaries give the wall a frozen appearance and produce an intriguing contrast to the painted surfaces. The graphics are a stylisation of the famous tunnel passage in Monaco. The three-dimensional structure of the capillaries causes the focus to shift with the visitors’ movement. The background of the vehicle and the reflections on it change constantly and lend the SLR the impression of dynamic movement.